Photograph courtesy Peter Lovell. Class 25s from the 25090 - 25099 batch were some of the most re-allocated locomotives on BR. 25096 was no exception, after ten years randomly moving about the LMR 25096 then saw the delights of Eastfield & Haymarket, a brief return to Bescot, then Bristol & Laira before heading north again to Scotland, this tour including a stay at Inverness. 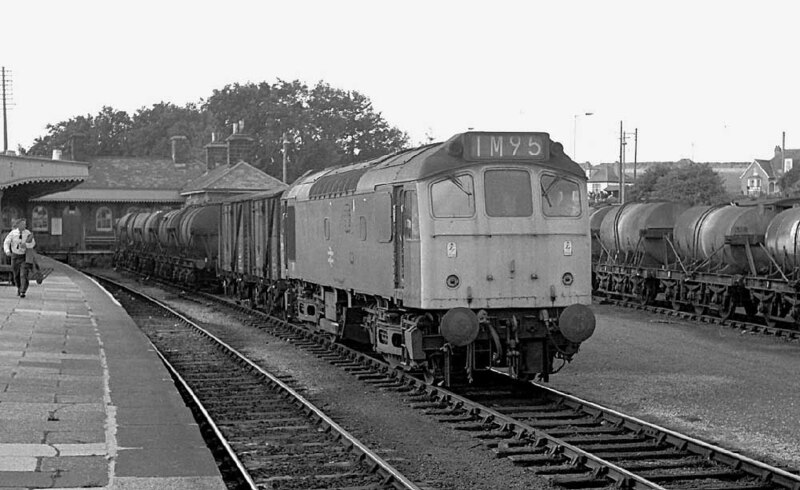 Seen here at St Erth on September 15th 1975. With twenty four transfers during its operating history D5246/25096 was one of the most transferred Class 25's, with allocations to Western, Scottish and London Midland depots. August 1964 to Derby (16C). November 1964 to Cricklewood West (14B). January 1965 to London Division Midland Lines (D14). April 1966 to London Midland Midland Lines LMML. August 1966 to London Division Midland Lines (D14) on loan. November 1966 to Nottingham Division (D16). March 1967 to London Midland Western Lines LMWL. March 1967 to London Midland Midland Lines LMML. Stored unserviceable October 25th 1977. 25096 was the 20th Class 25 withdrawn, one of two retired during December 1977. After withdrawal 25096 was moved to Glasgow Works and scrapped there during June 1978. Noted Crewe Works February 1968. Noted Derby Works March 1969. Despite being allocated to many depots, 5246/25096 had minimal recorded passenger workings. The first recorded passenger working took place on June 29th 1965, with D5246 & D5247 working the 06.35 Birmingham New Street - Bradford to Leeds (?). On June 22nd 5246 & 5255 worked the summer dated roundtrip Nottingham - Llandudno Town service. On June 21st 5246 & 5236 worked the summer dated roundtrip Nottingham - Llandudno Town service. On the evening of November 10th (?) 5246 & 7504 worked a 22.00 Narborough - Hamworthy special going as far as Eastleigh, thence returning light to Banbury, where they were procured to work the 11th's 12.10 Banbury - Reading West and 14.50 return. The failure of Class 45 No.97 on September 11th 1972 working the 16.50 St. Pancras - Derby saw 5246 & 7619 bring the service into Derby from ?? Three months later on December 14th the 13.50 Derby - St. Pancras was worked to Leicester by 5246 & 5291. 5246 managed at least one round trip to Skegness, from Leicester on July 22nd 1973 with 5268. Substituting for Class 45s on coal trains destined for the Kent area, May 14th found 5231 & 5246 on a Brent - Southfleet service and the return Betteshanger - Toton. Wagons of wood pulp in December 16th’s 05.25 Margam – Geli freight derailed between Cefn Junction and Tondu, the Margam breakdown train arrived behind 25096, a most unusual choice for this area. 25096 spent about two months allocated to Laira, whilst here it acquired a fine piece of passenger haulage. On October 4th 1975 25096 & 25093 worked the 09.35 Penzance - Wolverhampton throughout, a total of 310 passenger miles. On August 6th the 10.04 Glasgow Queen Street - Dundee was worked by 25096 & 26004. In South Wales the use of Class 25s for working regular diagrams was finished, Class 37s now taking up these diagrams out of Cardiff and Newport, though Class 25s would frequently deputise for a non-available Class 37. A number of workings brought foreign Type 2s into the area, on November 24th 25096 (IS) arrived with the 22.58 6V88 Warrington - Margam ingot train. The last recorded passenger working for 25096 produced another lengthy journey, on July 17th 1977 25096 & 25073 worked the 18.15 Barmouth - Alfreton & Mansfield, the return leg of a day excursion, a run totalling 204 miles. Last updated July 12th 2018.